Here’s a question: How hard is it to create ludonarrative dissonance in tabletop games which are primarily represented in the players’ heads? Crash course! Ludonarrative Dissonance is the idea that the way a game plays or the play experience of a game may have some sort of contradiction to the narrative or perceived theme of that game. That is to say, it’s an idea that crops up whenever you’re playing a game and feel that what the game says and what the game has you do don’t match up. It’s something of a whipping horse in the games discourse, a place we often go to. Myself, I find it a bit too smug as a concept to really deal with, and the people who first coined the term in academia aren’t wild about how it ran wild and was used as part of a wedge to create an implication of some sort of war between Ludic and Narrative elements. One of the common sources of the conversation was Bioshock where a game that was ostensibly about complaining about the mechanisms and solutions of objectivism was at odds with the gameplay experience of a game where you hoarded money so you could maximise your personal survival at the expense of others. That particular observation, for example, does sort of beg askance of yes, but the society you’re hoarding money in is a collapsed hellscape full of people stabbing you with knives, but it tends to come down to how you interpret the themes and the metaphors of the play, rather, necessarily that they’re about some objective value within the work. Wasn’t that great? Alright, moving on! The important thing is can you have that kind of dissonance in a card or board game? After all, card and board games are doing most of their work in your head, and it’s not very common you’ll have someone presenting a game mechanic that’s genuinely and obviously at odds with the themes of the work, at least, not anywhere it’s caught my attention. You’re here to achieve all you can and hopefully reach the American Dream. The winner is the player who collects the most money. Now you could see this as two lines in contrast with one another, but it’s much easier to read it as just being really cynical, isn’t it? There’s a similar thing in some city manager or economic games, where playing like a purist liberterian may make the game state flat out fail. There’s also the complexity of any game where there’s another player, where you might not perceive a failure in the game’s systems to explain its ideology as a byproduct of that other player hecking things up. This all makes this pretty hard to put our finger on, but I’d like to point to one example of a card game, that, for me, kinda doesn’t really work that well. CLANK! is a game that’s reasonably well-regarded by players and critics; it won several awards for ‘most innovative’ kind of responses, for example. What it is, in essence, is a dungeon crawler, where you, the players, are moving your little meeples through a dungeon, and picking up treasure and recruiting assistants. This is a well-worn design space, and we have a lot of mechanics for it. 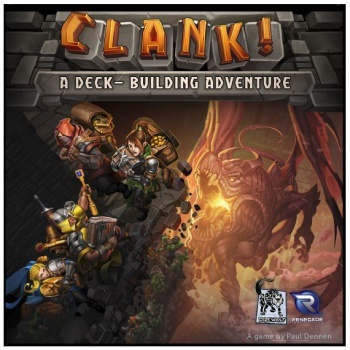 The thing that sets CLANK! aside is that it uses a deck-building mechanic to handle its loot and recruitment. And at first this seems like kind of a good idea; you can make it so that your cards all represent loot jiggling around in your bags and going clank against one another, and you can even treat it like going bust in Blackjack – you flip too many cards, you have to start again, so each turn has the chance to push your luck and so on. Myself, I don’t like this. Specifically, what I don’t like about as CLANK! executes it is has a board and the deck. This means that when you’re moving around, you’re also moving your cards – essentially meaning that your characters have two different abstractions for space. Is this a terrible idea? Probably not, but it does make me wonder about the deck. Deck builders are great for things that grow – but the deck has made itself so that the game sort of represents your personal effects? And as it grows you’re actually unhappy with it? At the same time, the fact that you can get dud draws or draws that aren’t helpful isn’t actually useful, or used for anything necessarily? Now I want you to understand: My dislike of this mechanic is theoretical. I have not played CLANK! and I’d be happy to find I was wrong if that’s possible. But it still strikes me as an example of where the feel of the mechanics doesn’t work for me in the feel of the game’s style. This blog post and subject was suggested, as above, by @JulienKirch on Twitter. If you’d like to suggest stuff you’d like to see me write about, please, do contact me!